People gather during a protest in favor of talks and dialogue in Sant Jaume square in Barcelona, Spain, Saturday Oct. 7, 2017. Thousands gathered at simultaneous rallies in Madrid and Barcelona in a call for dialogue amid a political crisis caused by Catalonia's secession push. Spanish Prime Minister Mariano Rajoy said Saturday that he would not rule out using constitutional powers to take away Catalonia's autonomous status if the region declared independence. Rajoy made the remark to the newspaper El Pais. "I don't rule out anything that is within the law," he said, adding, "I would like the threat of an independence referendum to be withdrawn as quickly as possible." 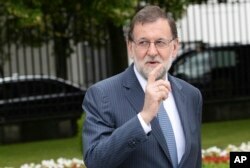 FILE - Spanish Prime Minister Mariano Rajoy. Earlier Saturday, thousands of protesters gathered at rallies in Barcelona, Madrid and other Spanish cities as Catalonians continued to push for secession after last Sunday's independence referendum. Organizers of the Catalonia secession rally had asked the demonstrators to wear neutral white, and not to display any flags, either Spanish or Catalonian. The demonstration organizers have been promoting the slogan "Let's Talk." 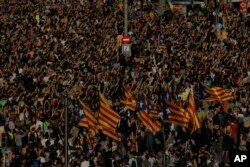 In Madrid, the Spanish national capital, there was a competing demonstration, for Spanish unity. That demonstration, centered on Madrid's Plaza de Colon, featured thousands of people waving red-and-yellow Spanish flags. Although Catalonians voted overwhelmingly for independence this week, the national government has called the vote illegal. Catalonian leaders are calling for dialogue with the national government. Spaniards pack Colon Square in Madrid, Spain, Saturday, Oct. 7, 2017. 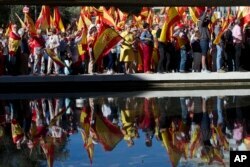 Thousands of pro-Spanish unity supporters donning Spanish flags have rallied in a central Madrid plaza to protest the Catalan regional government's drive to separate from Spain. A top EU official Thursday warned that the separatist dispute risks escalating into armed conflict. “The position is very, very alarming. Civil war is conceivable there, in the middle of Europe,” Gunther Oettinger, the German EU commissioner, said at an event in Munich. Oettinger and the EU Commission, the European bloc’s governing body, which fears Catalan independence might stir up separatism elsewhere in Europe, also have urged the authorities in Madrid and Barcelona to start negotiations and to avoid further provocations. But there are few signs of that happening. Both sides appear to be standing firm in Spain’s worst constitutional crisis since an attempted coup in 1981. Rajoy has said there can be no talks while Catalonia’s separatist leaders are threatening to issue a declaration of independence on the back of the unauthorized plebiscite. In that poll, deemed illegal by Madrid, 90 percent voted to break with Spain, but the turnout was well under half of the electorate. Opinion polls have consistently suggested that more Catalans favor remaining in Spain. Secessionist anger in Catalonia has only intensified, though, over the violence last Sunday when Spain’s national police and Civil Guard fired rubber bullets, roughed up Catalans and raided polling stations as part of an effort to disrupt the plebiscite. Catalan authorities say almost 900 people were hurt in the crackdown. Protesters with ''esteladas'' or Catalonia independence flags pack the University square during a one-day strike in Barcelona, Spain, Tuesday Oct. 3, 2017. Catalan anger has been further provoked by Spain’s constitutional court barring Catalonia’s regional parliament from sitting on Monday in a session scheduled to discuss the results of the Sunday referendum, and possibly to declare independence. With the crisis deepening, and no sign of an end to political instability, some Catalan businesses have announced they are relocating their headquarters to other parts of Spain to avoid the possibility of getting knocked out of the European Union common market by a Catalonian secession.